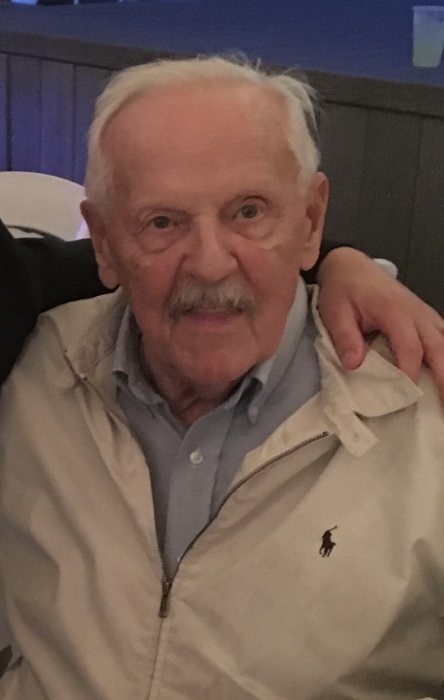 Ted Keplinger, 91, of Logansport passed away peacefully at 4:25 a.m., Monday, February 4, 2019 at Woodbridge Health Campus surrounded by his loving family. Born on June 3, 1927 in Logansport, he was the son of the late Leroy and Odessa (Shadel) Keplinger. Ted was a WWII U.S. Navy veteran. He was married to Mary Alice Harrell who preceded him in death in 2012. Ted was a retired machine operator from Gencorp in Logansport. He enjoyed reading, watching the news, going to the Blue Chip Casino, going to lunch with his daughters, and spending time with family. Survivors include his children, Connie Burkett of Logansport, Rick Landis of Arizona, Karen Peters (Wes) of Logansport, Kathy Reichel of Logansport, Mary Clem (Don) of Logansport and Patty Henry (Gary) of Galveston, and grandchildren, Shelly Popejoy (Joe), Jesse Peters (Stacia), Britni Manus (Jason), Eric Burkett (Lisa), Aaron Burkett, Donnie Reichel, Anthony Reichel (Heather), Matt Reichel, Alyssa Reichel, Amy Price (Jon-Myckle), Alex Clem, Evan Clem (Alyssa), Lee Vernon (Gigi), Nicole Vernon and Rachelle Bair (Rick). He is also survived by 16 great grandchildren and 2 great great grandchildren. He was also preceded in death by brother, Slate Keplinger, twin brother, Fred Keplinger and sisters, India Jobelman, Virginia Gloser, Betty McKeever and Rose Bowen. Services will be at 1:00 p.m., Thursday, February 7, 2019 at Marocco-Rans Funeral Chapel with Pastor Jeff Hayes officiating. Visitation will be 1 hour prior to the service on Thursday at the funeral home. Burial with Full Military Rites will be performed at St. John’s Cemetery. Please sign Ted’s online guestbook or leave a condolence for the family at www.ransfuneralhomes.com.